All packages include tank and weights, free collection and return to your hotel, personal attention from the dive guides and instructors, use of our divers information resources, transfers in and out of the reserve, free tea and coffee, and use of toilets, wifi and other facilities in Casa Limon!. Full standard equipment hire is €85.00 for five days or €20.00 for one day, but if you have some of your own equipment we reduce the price accordingly. 2. Not got a Qualification ? If you want to get your PADI qualification, then you can choose from the two-day or four-day courses. The current prices for each course are shown individually on the relevant page in the training section, including details of what is included in the price. Click one of the links below to get the details of the course you are interested in. For other courses see the Learn to Dive pages or contact us for more information using the link below. "Without doubt, one of the best diving spots in Gran Canaria" Descubre Gran Canaria bajo el mar. Every guidebook on diving in Gran Canaria and the Canaries will tell you that this is the very best spot on the Island for a range of dives. The El Cabrón Marine Reserve has an international reputation for being the best dive site on the Island. 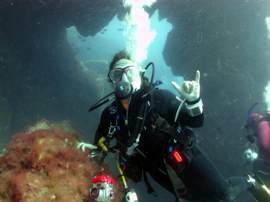 There are different dive routes for different grades of diver, from easy, up to challenging. Both the variety and quantity of marine life always amazes divers new to the area. Always a chance of 'big stuff' including Barracudas, 5 varieties of Stingray, AngelShark, 3 varieties of Moray, Sama, Tuna, and rare sightings of pelagic sharks and mantas. Some rare and unusual 'little stuff' such as Sea-Horse, Canarian Lobsterette, Giant Anemone and Echiuida and red-legged octopus at night can be fascinating the first time you see them. If you are coming to Gran Canaria then you don't want to miss out on the chance to dive here! Our objective is to be the most relaxed yet professional dive school in Gran Canaria, and give you the best customer service and diving experience on the island, within a structured safety framework. This is what we are doing to achieve that. Our award winning dive base at Casa Limon is the most spacious dive centre in Gran Canaria, with a large garden where our divers chill out between dives under the lemon, fig and pomegranite trees! It is a step apart from all other dive centres because of the facilities and comfort it offers. Toilets, hot drinks, free wifi, and both sunny and shady areas to relax in between dives! Access to local shops and cafes for snacks and freshly made sandwiches. The Free transfers from your hotel to the dive centre give an end to end experience and take the hassle out of coming diving. Our team are long serving, mature diving instructors, with most of us diving here for more that ten years! We can show you more secrets that anybody else can. A philosophy of providing a safe, friendly environment which leaves every diver proud of the dives they complete with us. Great Customer Experiences are our aim - if we don't deliver - tell us! You can add to these packages with extra dives, excursions, night dives etc. If you want to do something special (such as dive just in the morning) then we can tailor a package for you. Special Last Minute Offers We may be able to offer special low prices and discounts for pre-booked diving and courses if we still have availability. Use our Last Minute Discounts to find out how much you can save with Last Minute Special offers or early booking discounts. We accept payment in cash or cards from Visa, Mastercard, Switch/Maestro (but not American Express or Diners Cards). We have had problems processing 18-digit HSBC Maestro cards and cannot accept these. Note that the local banks charge us excessively to process travelers cheques (six percent!) so we advise our customers to change them first in their hotel or bank, which is usually commission free for the holder. It is very easy to tell us what diving you want to do while exploring the El Cabrón Marine Reserve with us, book your holiday, or learning to snorkel or scuba dive on a PADI course. We believe that our prices are similar to most of the other professional diving schools in Gran Canaria, but depending on the package and the school we may appear to be a couple of Euro's more (or less!) expensive. We believe that our exceptional service, proximity to the reserve and great diving justify this. However if you dive with us and don't agree, then tell us (and why) and show us a competitive quotation for similar diving in the marine reserve and we will either refund the difference or charge you at the lower rate!